When I was a child, blue laws did not permit most retailers to open on Sunday. But business has changed dramatically and is so competitive, that for most retailers, being closed on Sunday would be suicide. Some find the laws antiquated and draconian. Others find these old blue laws to be a blessing to laborers, insuring at least a day off. When you run across a business that does any retail that is closed on Sunday, you know that they have a very niche business, an off-the-beaten-path location or they are very old school. The latter is the case with Joe's Dairy at 156 Sullivan Street in an Italian area of SoHo/South Village, nearby Rafetto's - another wonderful Italian food store which I have previously written about - see here. I have been waiting to do a story on Joe's for some time. The right opportunity presented itself recently and I strolled in to find a congenial and accommodating staff. I was extremely pleased to learn that the owner, Anthony Campanelli was on premises making his renowned mozzarella. A few paces into the tiny back room and I found Anthony surrounded by huge cauldrons of boiling water, working his magic for customers citywide. He stopped to speak to me, taking the brief meeting quite seriously. With no objections, he allowed himself and the kitchen to be photographed. See photo here. He buys his curds in bundles from a supplier in Buffalo, New York, receiving deliveries three times a week. Each bundle weighs 45 pounds and Anthony runs through 25-40 bundles a day - nearly a ton of cheese. Most consider this to be the finest mozzarella in New York City and it comes in a number of flavors. 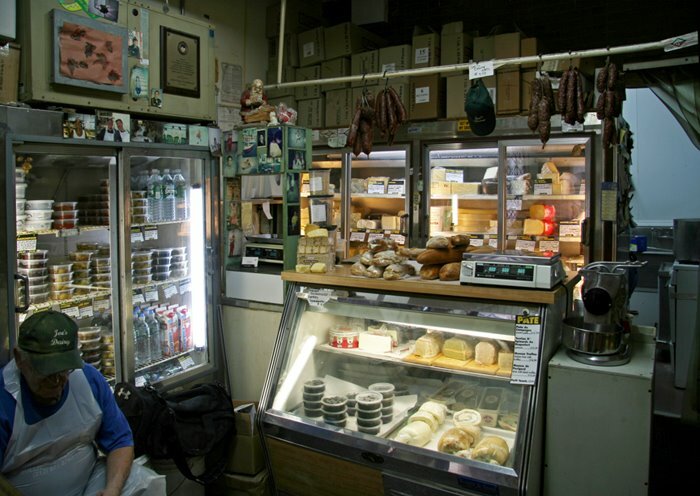 The shop also sells a variety of Italian food products - imported cheeses and other goods. Afternote: In writing about Buffalo, NY, the word "buffalo" spurred me to make a follow-up phone call to Anthony and enquire whether he made buffalo milk mozzarella. He does not, assuring me that buffalo milk curd is not available in the United States (all his mozzarella is from cow's milk). Mozzarella di Bufala Campana is imported from Italy. Many consider it to be finest tasting - it is featured on many restaurant menus.